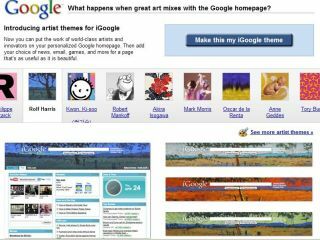 Google has attempted to jazz up its iGoogle service – allowing users to put designs by the likes of Jeff Koons, the band Coldplay and, in a (brush) stroke of genius, Rolf Harris on their personal homepages. iGoogle allows people to customise a page with gadgets and RSS feeds, but the relative paucity of designs has never truly endeared it to the masses. But can any man resist the lure of having a Marc Ekko exclusive, or better still Rolf’s landscapes draped across their browser? Anne Geddes famous baby photos make an appearance, Dolce & Gabbana provide a leopard skin (we assume it’s fake) and Kwon Ki Soon’s efforts are, well, colourful. Check them out at http://www.google.com/help/ig/art.